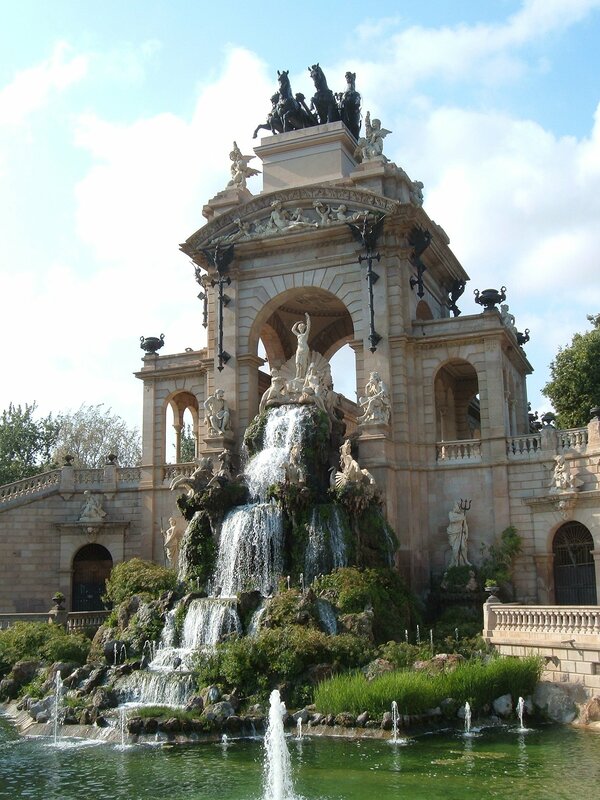 The great fountain in the Parc de la Ciutadella of Barcelona, by Josep Fontsère, with some minor work by the young Gaudi. 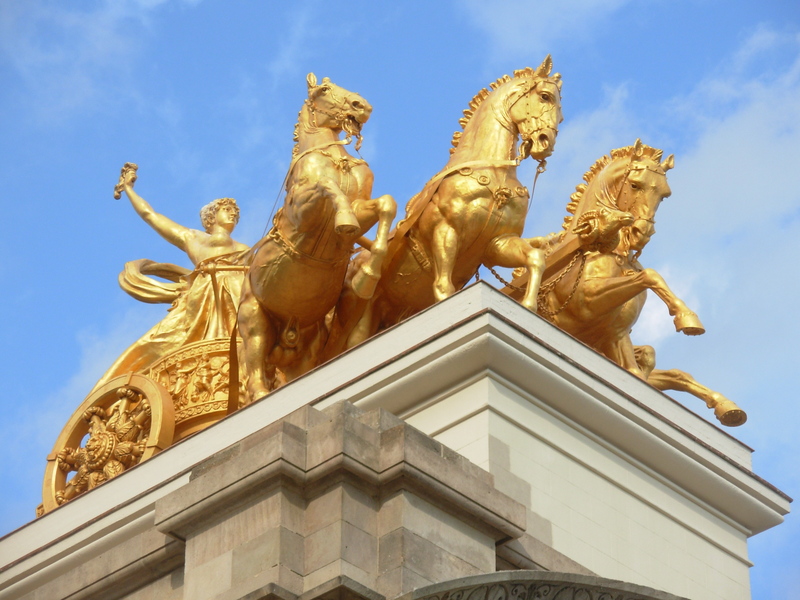 The horses on top have been re-gilded now. To me, the wonderful thing about this exuberant and dramatic concoction is the way the vegetation is incorporated as part of the architectural/sculptural ensemble. 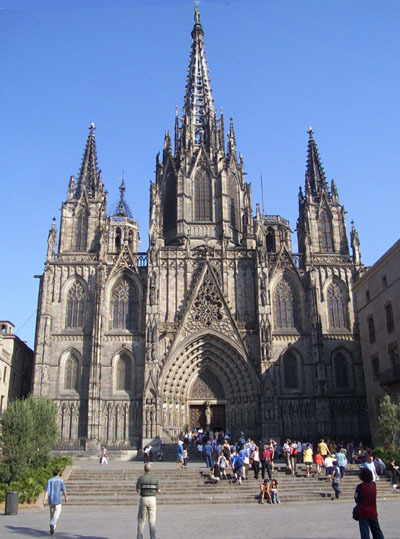 The gothic cathedral style in Catalonia is a bit different from that of France, although you might not know it by looking at the façade of Barcelona’s cathedral. When you walk in however, the difference is immediately apparent, and you see what is obvious in the plan, that there is no clear crossing making it into the shape of a cross. Although the photograph below exaggerates the effect, you feel as if you have walked into a giant vaulted shed, and that there is no clear division of space into aisles, although everything does point towards the altar. 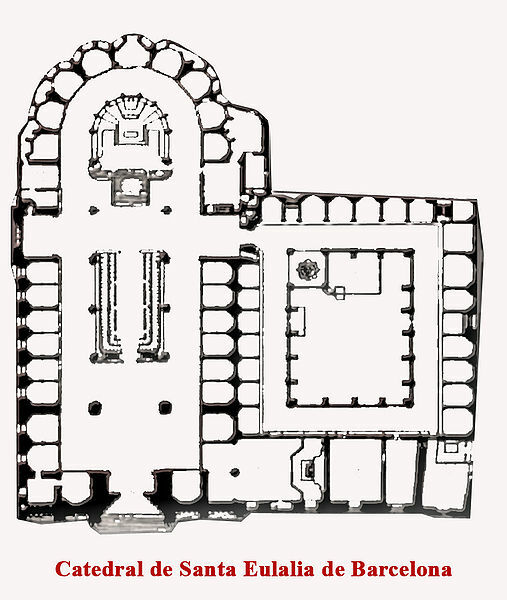 The French Gothic plan at the right, below, has a definite crossing aisle that is not present in Catalan Gothic churches. 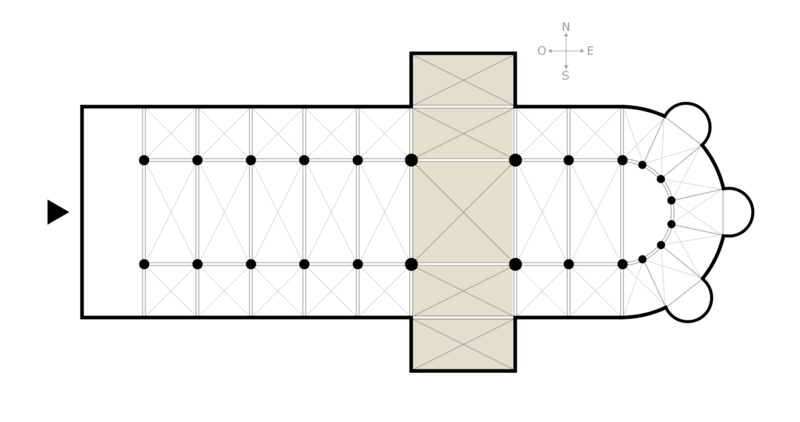 Note that the crossing in the plan at the top, in Barcelona, is achieved by removing side chapels, not by extending the fabric of the church building outwards. Why is this peculiar to the region? It may be the more strongly lingering effect of the classical tradition, flowing from Rome, of the basilica form. 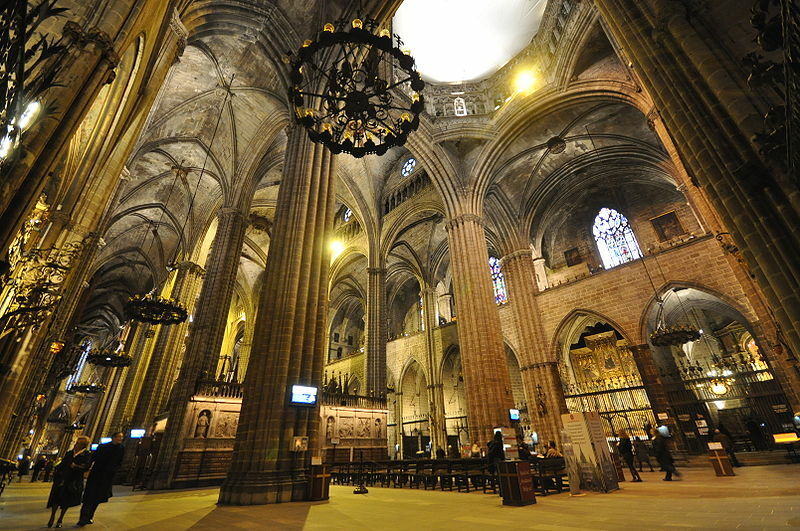 Basilicas are basically long, covered spaces that are rather wide, often with aisles formed by columns. 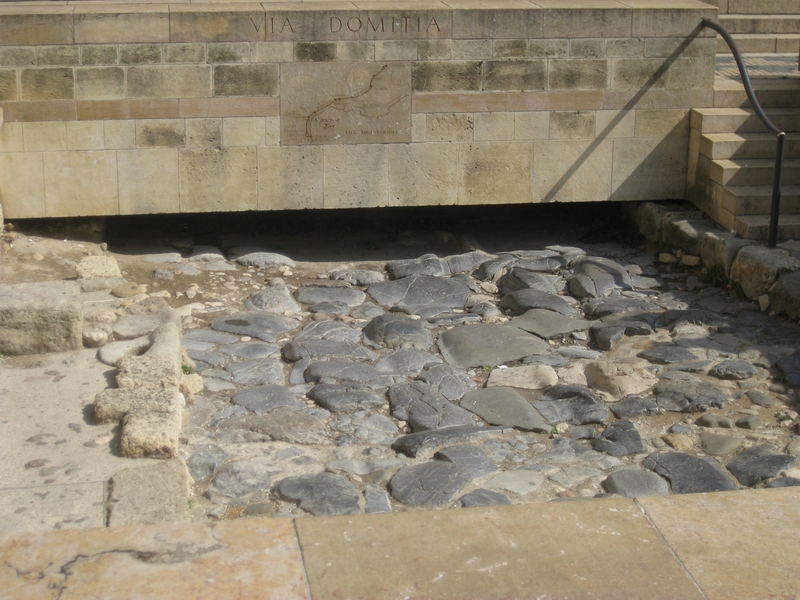 The are derived from the Roman public buildings used for government and social functions. Catholic churches at first were simply basilicas with Christian symbols, and many important churches still are called by the name, e.g., Basilica of Saint Peters, the biggest of them all, despite its Christian plan with a crossing and dome at the intersection. 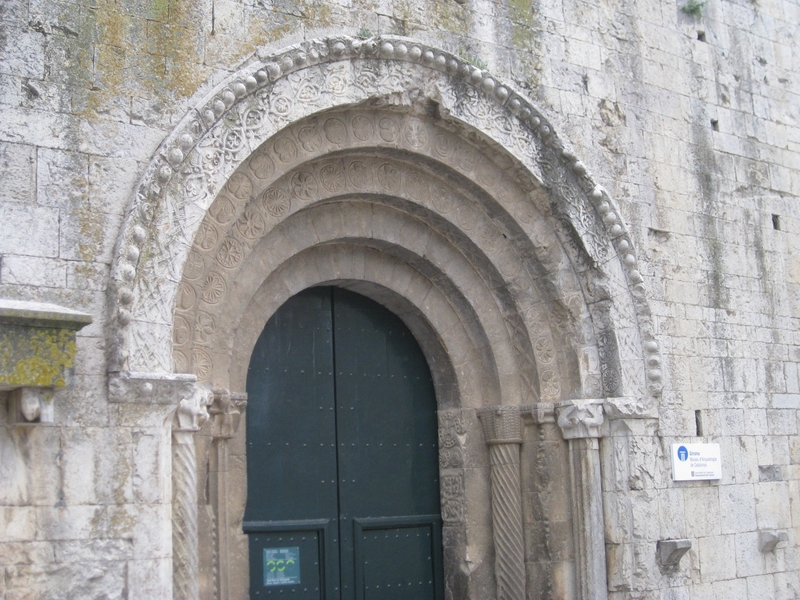 The basilica form was retained during the Romanesque period, and never abandoned in Italy at all until the Renaissance. At that point, a great debate ensued over the proper form for churches: symmetrical with a central dome, which pleased humanist intellectuals but had pagan and Byzantine, i.e. Eastern Orthodox connotations, or the cross-form that was very respectable but associated with Barbarians by the Renaissance intellectuals. 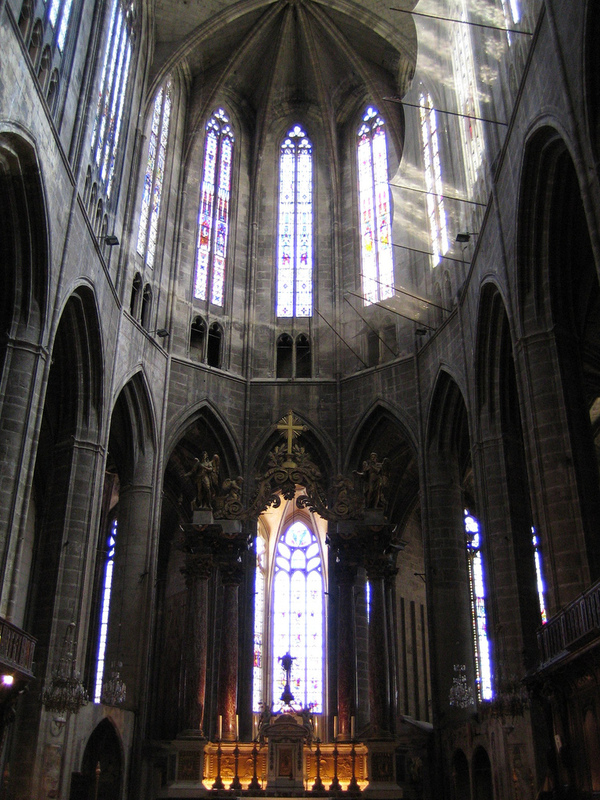 French Gothic cathedrals often have dramatic flying buttresses to hold up their thin walls that are filled with glass, which cannot bear a load. 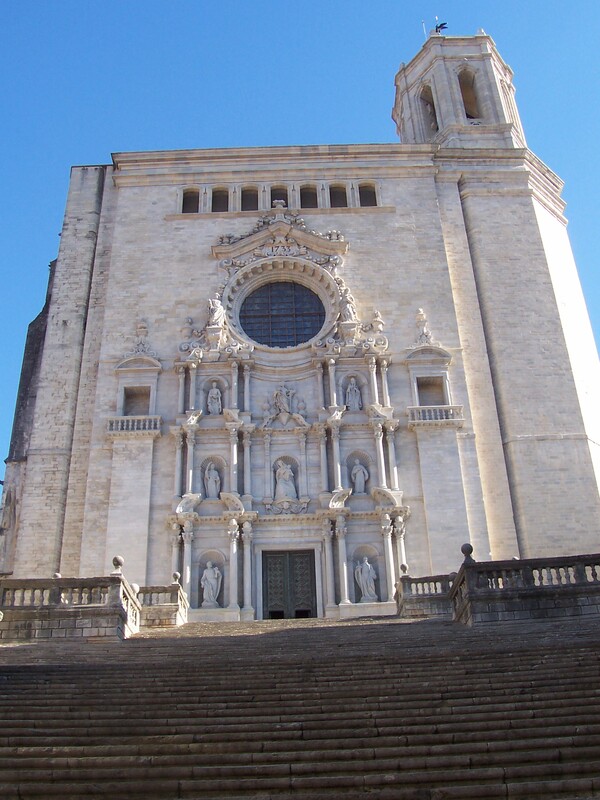 The outside of the apse of Girona cathedral shows only a few rather puny flying buttresses, and they ‘fly’ nearly horizontally – more like static braces. 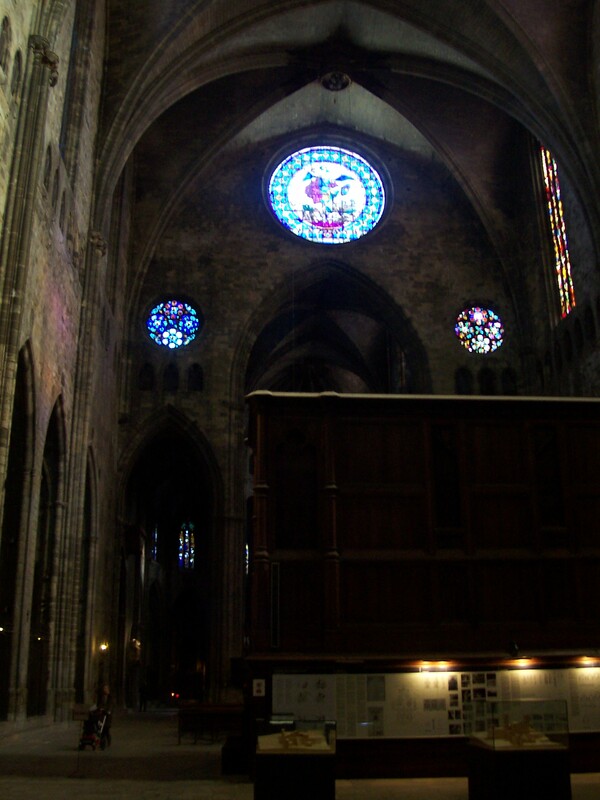 The interior of the apse at Narbonne, not all that far from Catalonia, but definitely under the sway of the heretic-slaying northern French by the time this was built, shows the striving for lightness and soaring verticality that is just not part of the Catalan style. 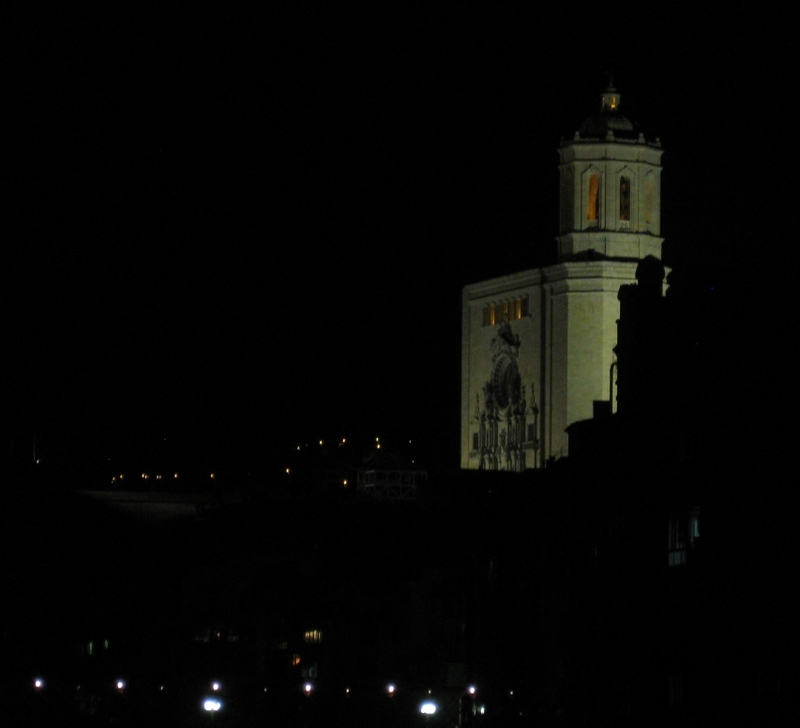 The inside of Girona cathedral is big, but boxy, as is the façade. The baroque era statuary and the tremendous flight of steps that was added accentuate the drama of its sheer mass. 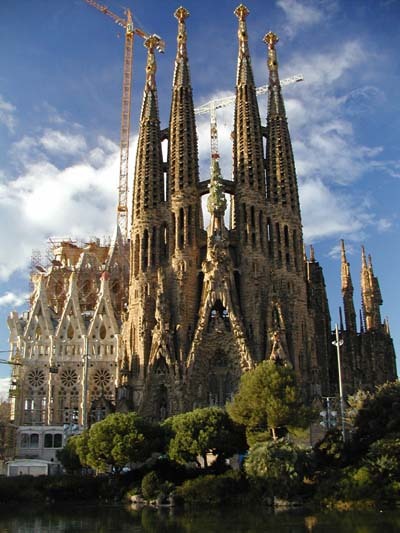 You can’t talk about cathedrals in Catalonia without mentioning the church of the Sagrada Familia by Gaudi, begun in the late 19th century and scheduled for completion in about thirty years. 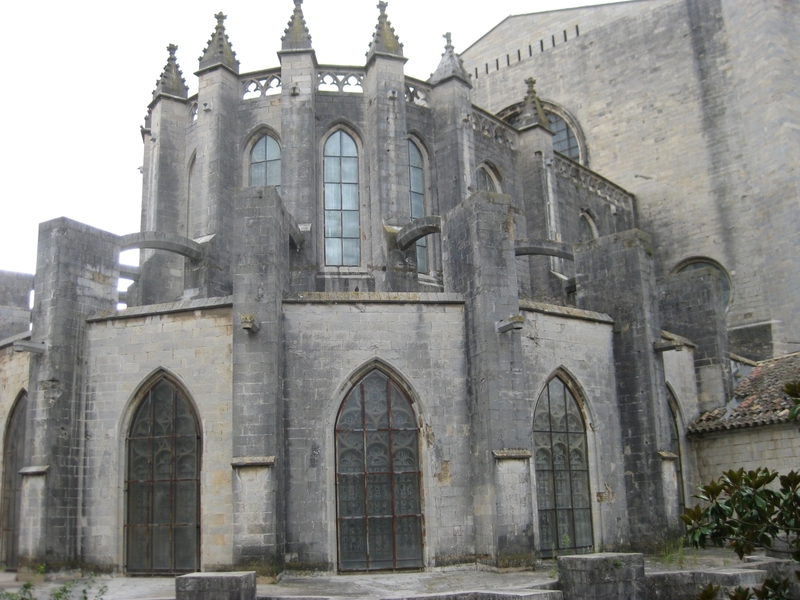 Some of the gothic cathedrals took centuries to complete, some were raised in a few generations. 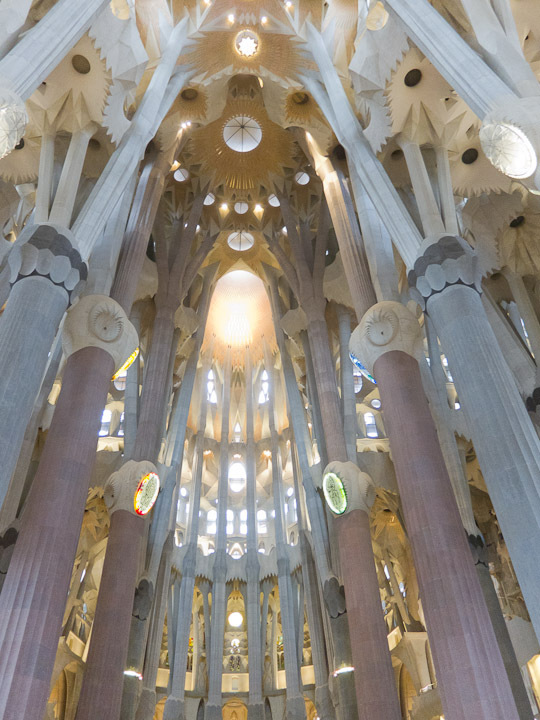 Gaudi had his own style, inspired by gothic, art nouveau, and physics. The main space of the Sagrada Familia is like no other interior I know or have imagined. It seems utterly fantastic, like something that belongs in a set for Star Wars, but it is not built of plaster and steel framing – only hard, carved, heavy stones set one on another. In this space, you seem to be inside a structural skeleton, yet unlike gothic interiors, the ribs and vaults seem to have a life of their own and they extend into and beyond the surfaces they support. 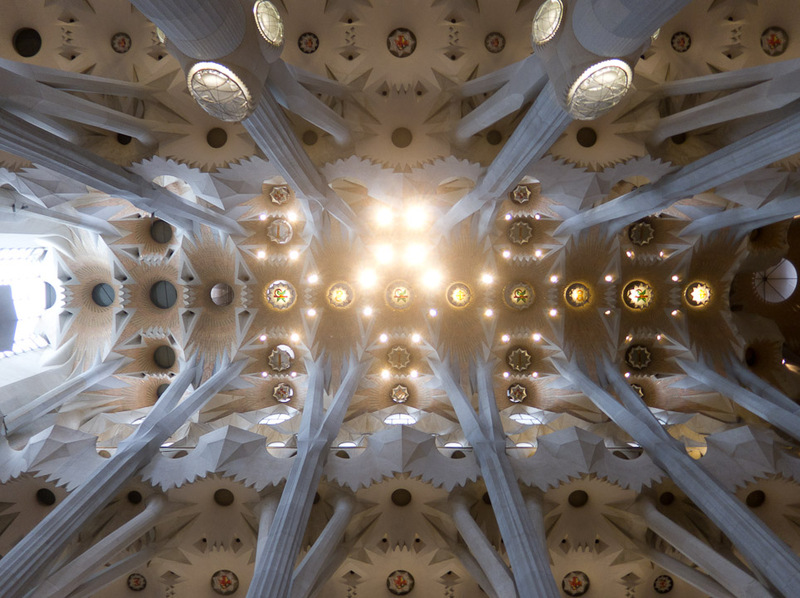 Gaudi favored the catenary arch in his buildings, a form that is developed mathematically, not from aesthetic preference. 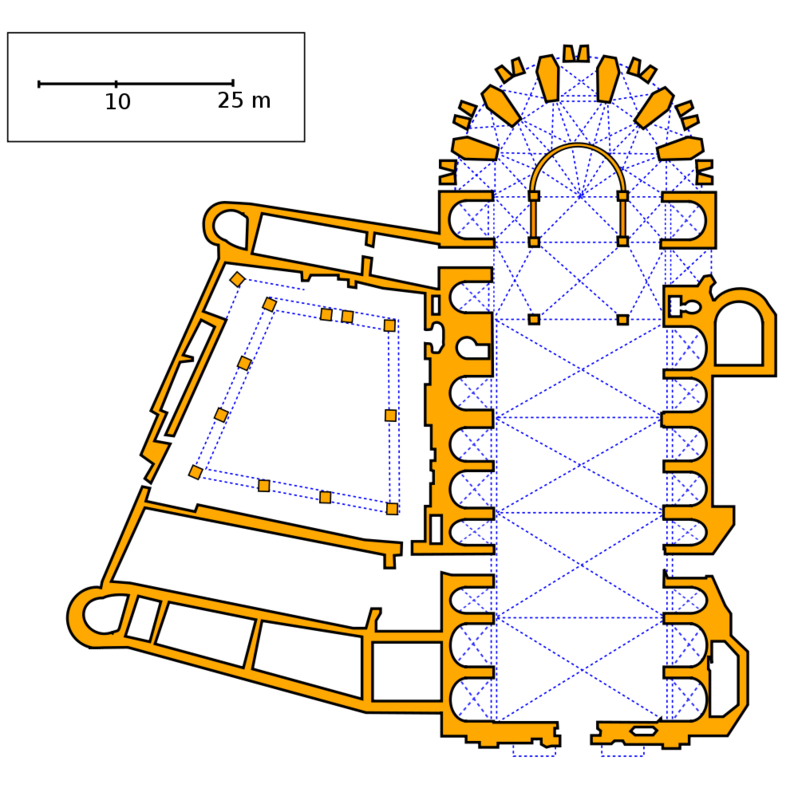 They are often referred to as parabolic arches, but they are slightly different, as you can see in the plot below. A catenary curve is formed when a rope hangs from two points without any load but its own weight. A parabolic curve is formed when a rope hangs from two points and supports additional loads at even intervals of space, as with the suspension cables on a bridge. 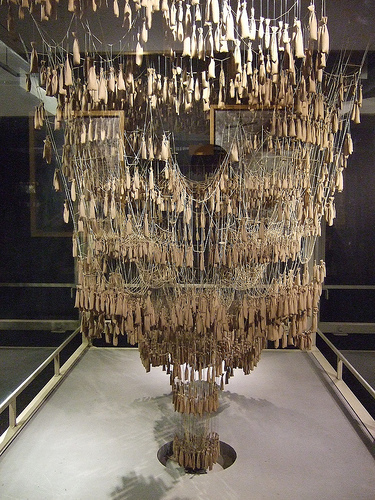 Gaudi felt that the catenary arch, an inverted catenary curve, was best suited to carry the weight of his buildings, and he created this dizzying inverted model of the Sagrada Familia to test his designs. Each hanging string and weight represents an arch in the stone structure. 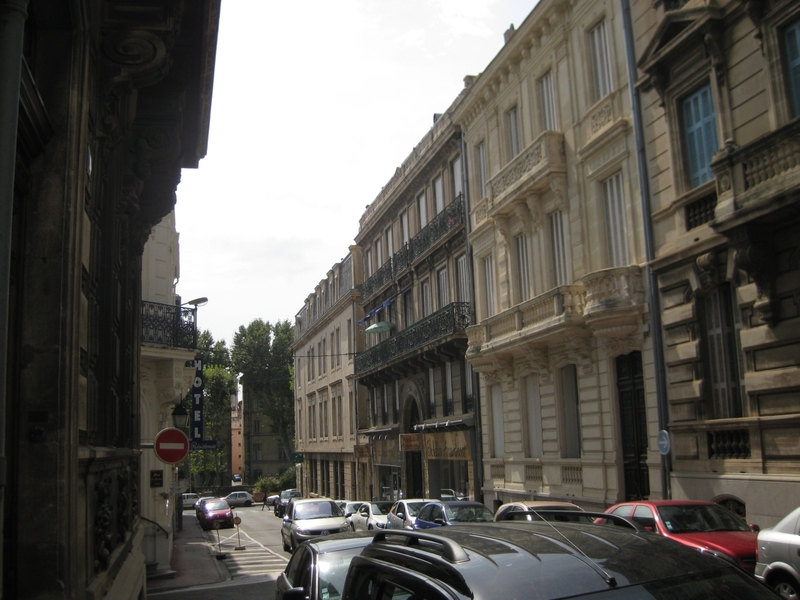 Outside, the facades look almost traditional compared to what’s within. 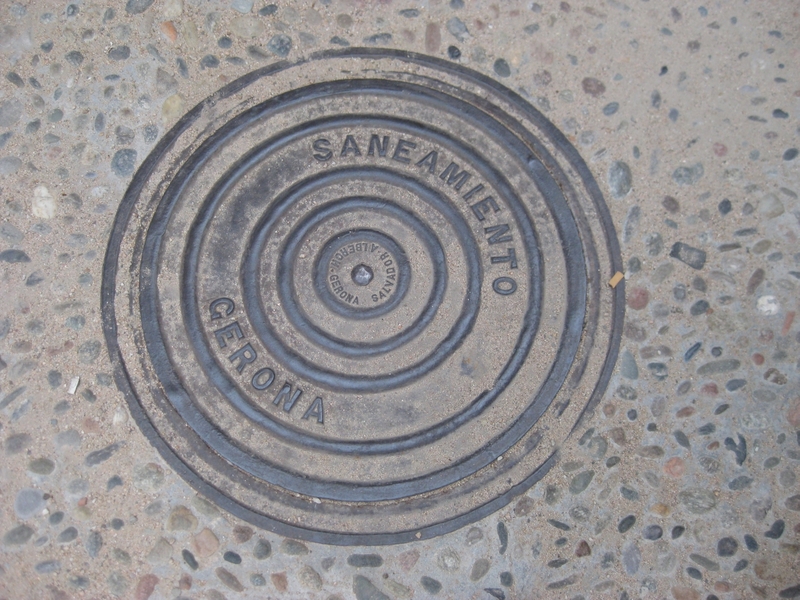 Gaudi too, honored the classical tradition, sometimes in odd places. 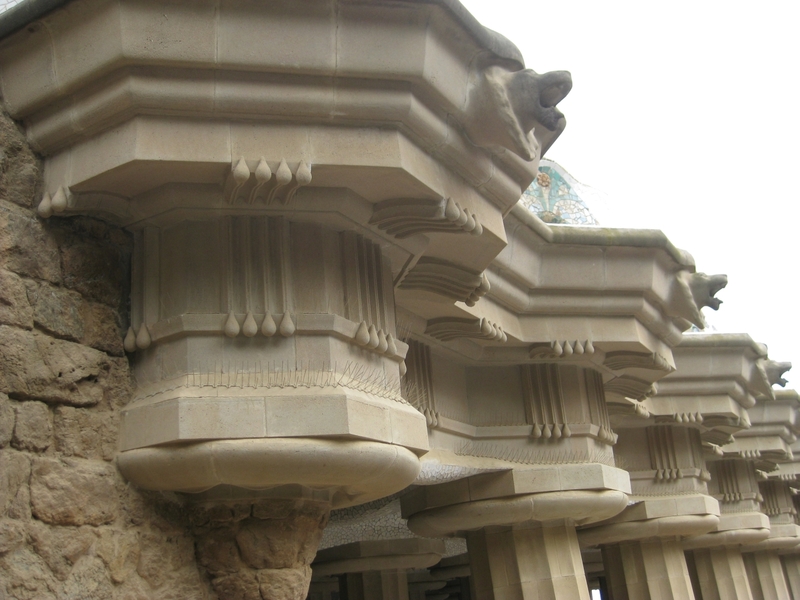 Here, in a detail from the pavilion at the Guell Park, is a variation on the Greek Doric motif, complete with drops of water placed on the dentils in the frieze. 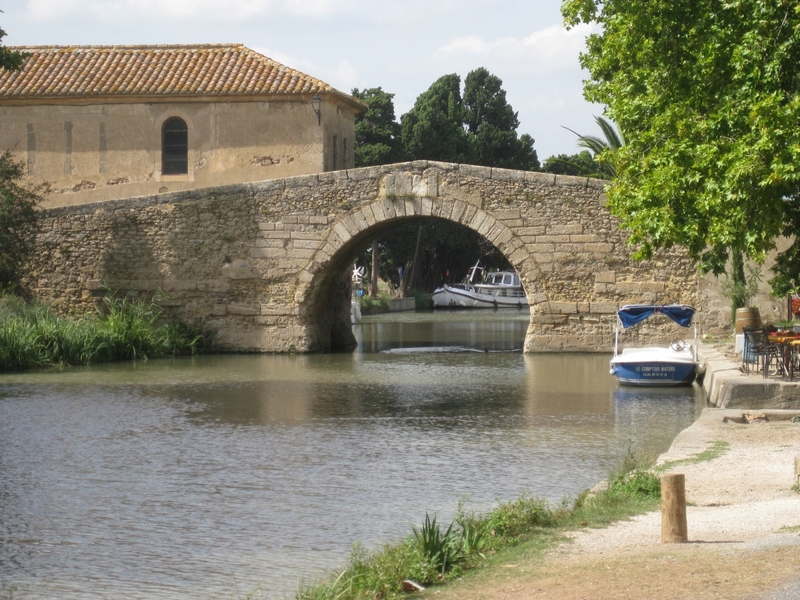 In southwest France, dans le pays Cathar, lies the Canal du Midi, an engineering marvel of the 17th century built by Pierre Paul Riquet. 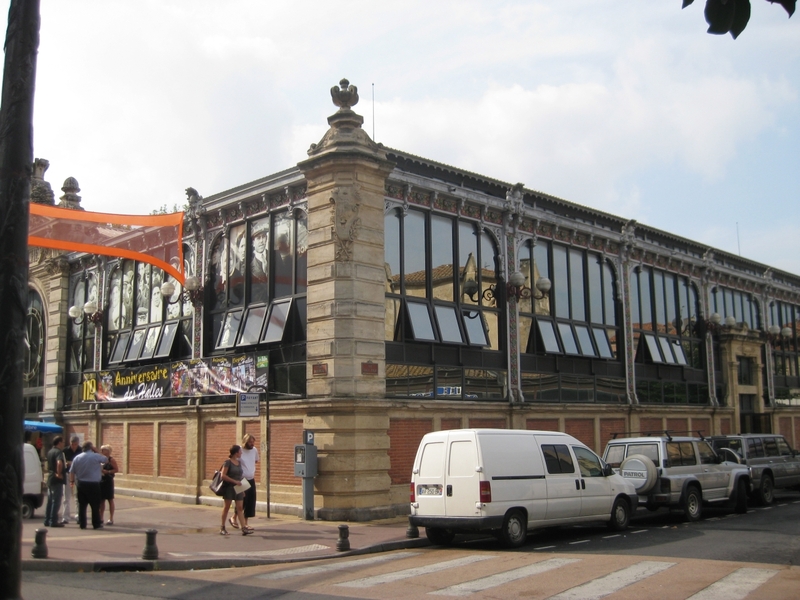 It was built in only fifteen years (no machines, of course) when Riquet was in his sixties, and despite the backing of Louis XIV and his minister, Colbert, many thought it would never be done. The motivation was simple: connect the Mediterranean to the Atlantic, and cut out the part of the sea route that requires sailing around the entire Iberian peninsula when shipping goods. 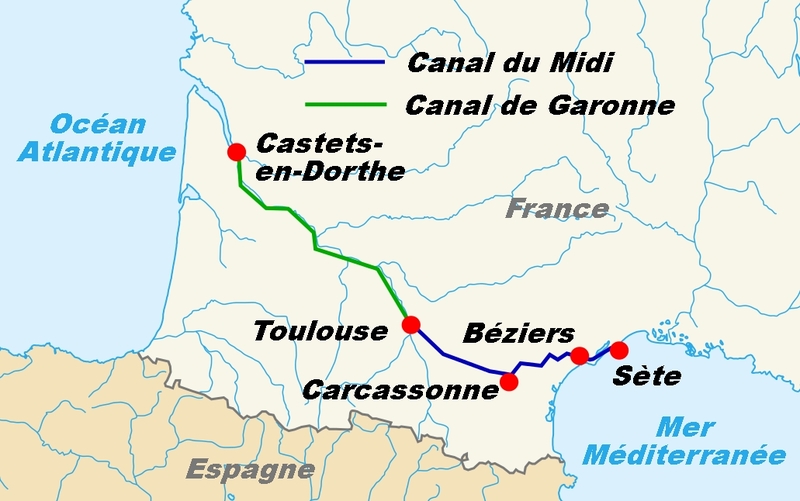 It starts near Narbonne on the sea, and moves roughly west to Toulouse, where it meets the Garonne Canal that was built earlier. Once it was complete, it became a tremendously important link in the commercial network that was retired only with the coming of the railroads. 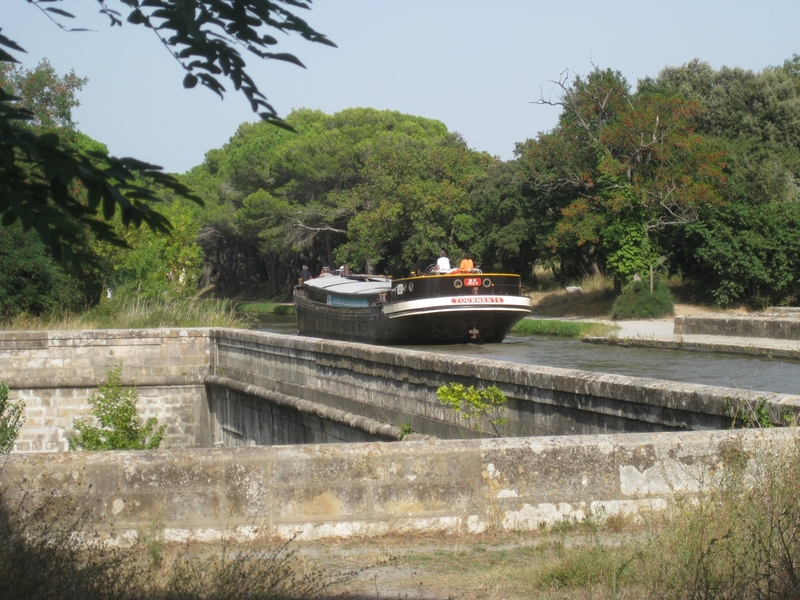 Canals often have to have locks to allow barges to negotiate the drops in elevation that can’t be avoided on route, and in the 1670s, the design of locks had approached what is used today. 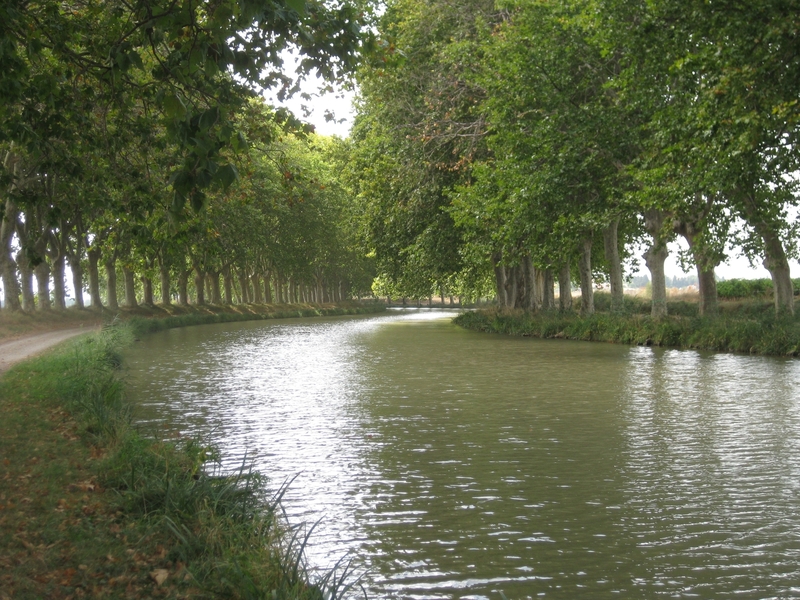 What was unusual about the Canal du Midi was the that is followed a course with a pronounced peak along its course (see below) so that water in the channel would be flowing in two directions at once: to the Mediterranean; and to the Atlantic. That meant that there had to be a constant source of water at the summit, not an easy thing to supply in a region that is often parched in the summer. This is why Riquet’s proposal met with such scepticism. Riquet solved the problem by capturing the flow from the Montagne Noire, where there were several large streams that became torrents in the winter. He built a large dam and created a huge reservoir at Naurouze that keeps the water flowing nicely all the year ’round. If you’re into this sort of thing, you can learn all the details in From Sea to Sea by L.T. C. Rolt. 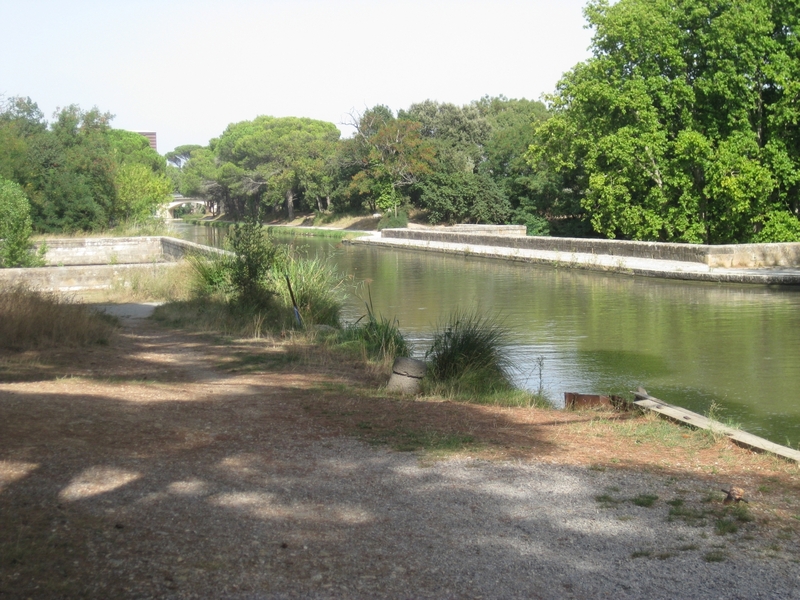 Today the canal is just for leisure: walking, biking, and exploring on boat and barge trips. 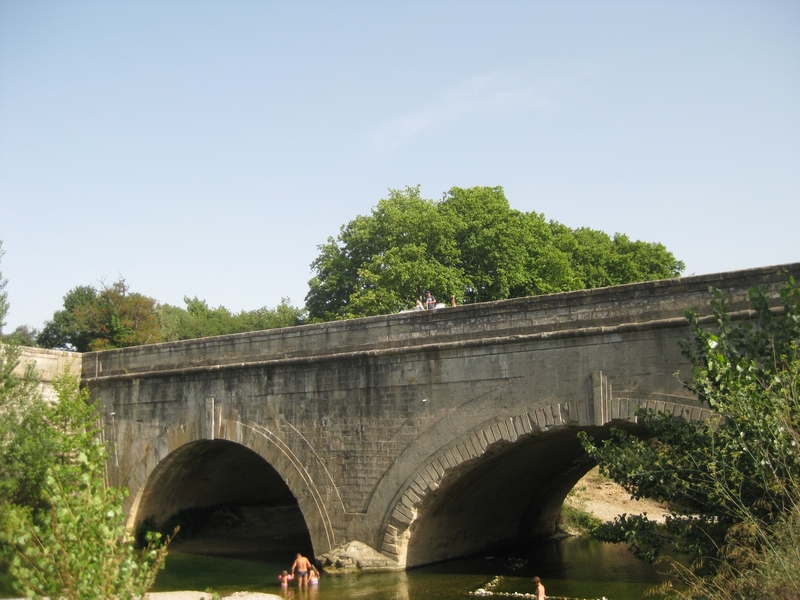 Here’s a picture of where we rented bikes, a picturesque spot in la France profonde (deep France). 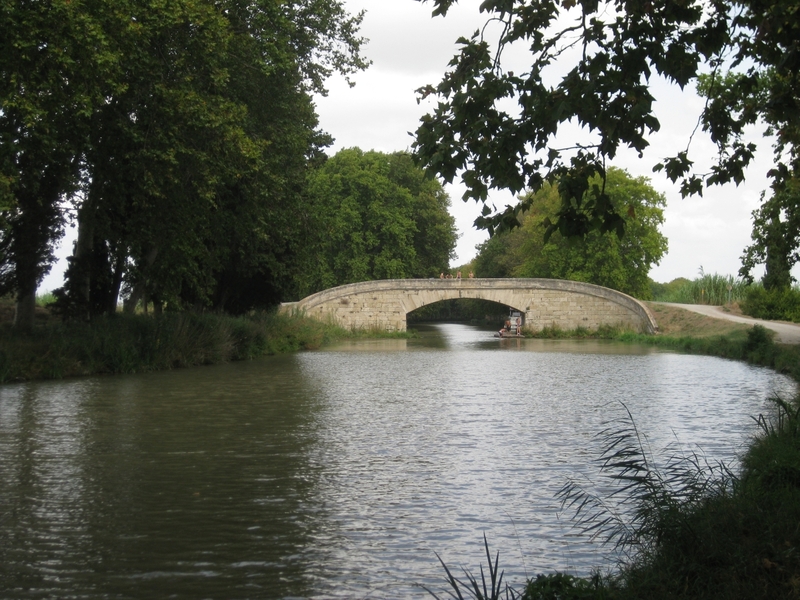 There are places where it a stream crossed the route of the canal, so a pont canal, a canal bridge, was created to carry the water road over the water! The images below show the canal from the level of the tow path, and on the right, from the stream. If you look closely at the second picture, you can just make out a boat crossing the stream at the midpoint of the bridge. Here’s a better view of a barge crossing the water bridge over the stream. This one happens to have been built by Vauban, of fortification renown, after Riquet had died. There are many lovely structures on the canal, including bridges like this one that, more conventionally, carry roads over the water. When I was there, kids were doing backflips into the water off of it. 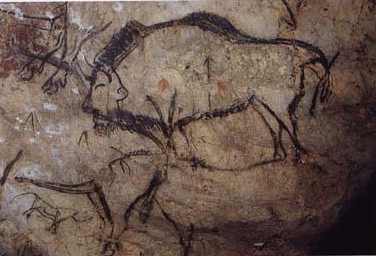 Once again, I have to ask, “Who were they?” These cave paintings of bison at Niaux are as good as it gets with freehand drawings. Done by torchlight, in the back of a long dangerous cave passage, with primitive brushes no less…about 15,000 years ago. The large domed chamber near these images has an excellent echo, and the guide suggested it may have been a hangout for shamans. 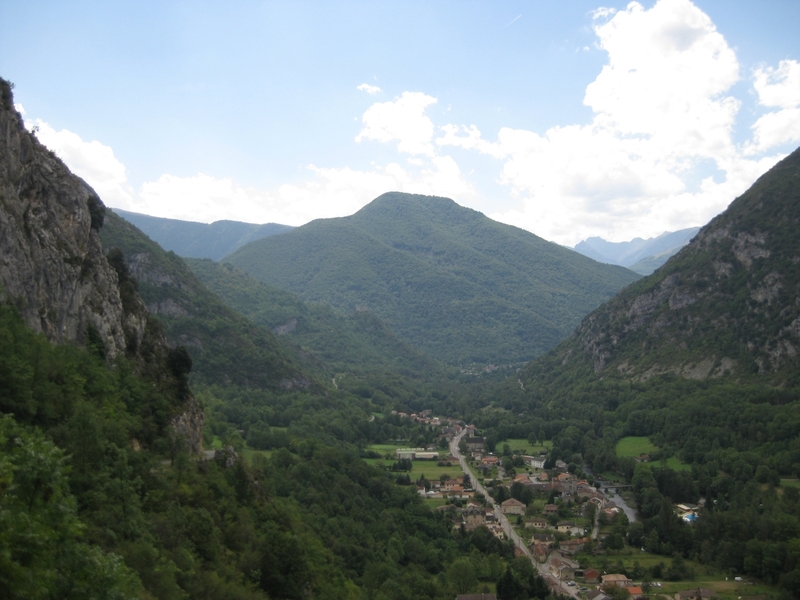 The cave is not easy to get to, and the view from the entrance of the glacial valley is impressive. I wonder what the artists thought of it. Meanwhile, back in the near present, i.e. about 800 years ago, this land was the Pays du Cathar, a region where a heretical sect, a sort of Manichean twist on Christianity, held sway along with the local language, langue d’oc. (Up north, ‘yes’ was oui, but down here it was said oc, thus the language of ‘oc)’. Although closely related to Catalan, it didn’t survive as well. The northern French, with the agreement of the Pope and the creation of a special French Inquisition, launched an internal crusade, known as the Albigensian Crusade after the city of Albi that was a political center of the heresy, and successfully stamped it out with great brutality. 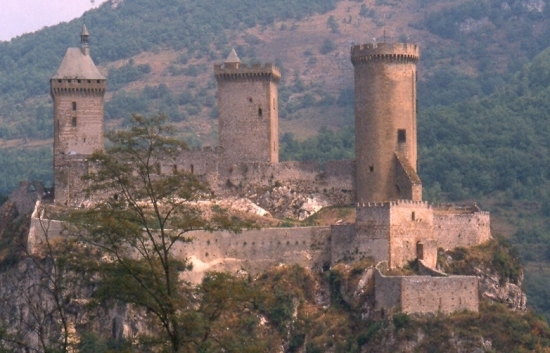 The castle at Foix, located in a stunning valley, is one of the many strong points that couldn’t hold back the tide of the north. Jo sóc un jueu autèntica. 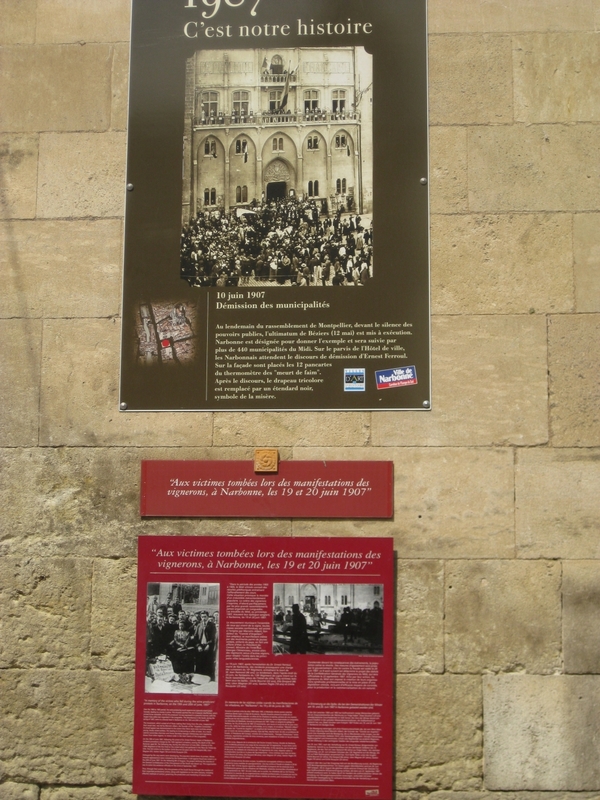 Wandering around the medieval quarter of the wonderful town of Girona, peeking into the courtyards in the Jewish quarter, reading plaques about this and that bit of Iberian Judaica that vanished with the Inquisition of 1492, never to return – no Jews here now! 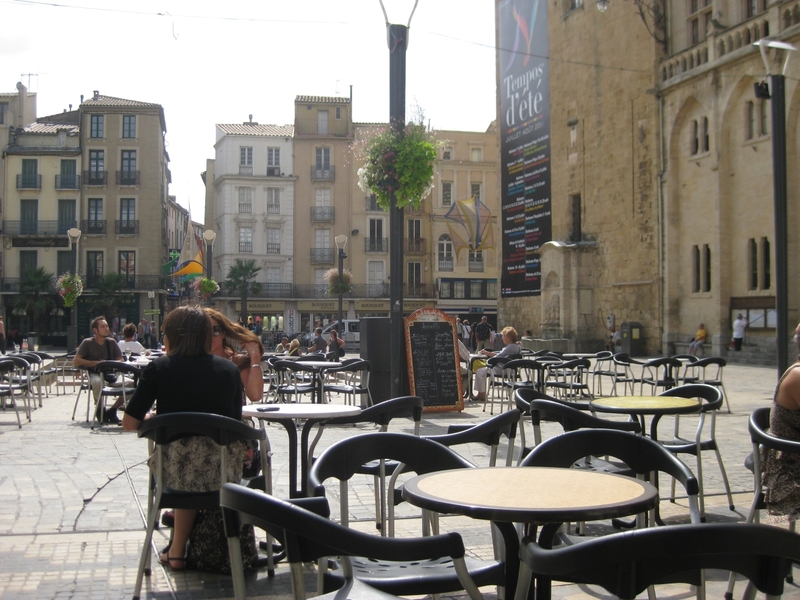 – I felt like declaring to the curators or restauranteurs, Jo sóc un jueu autèntica! (Catalan for, “I am an authentic Jew!) Maybe get a free snack, or a discount museum admission? I thought better of it. 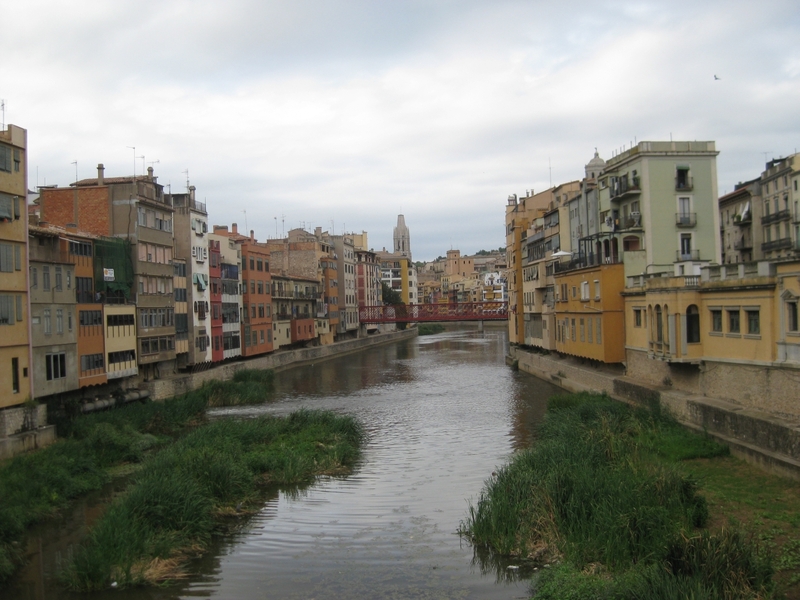 Gerona is beautiful and fascinating. 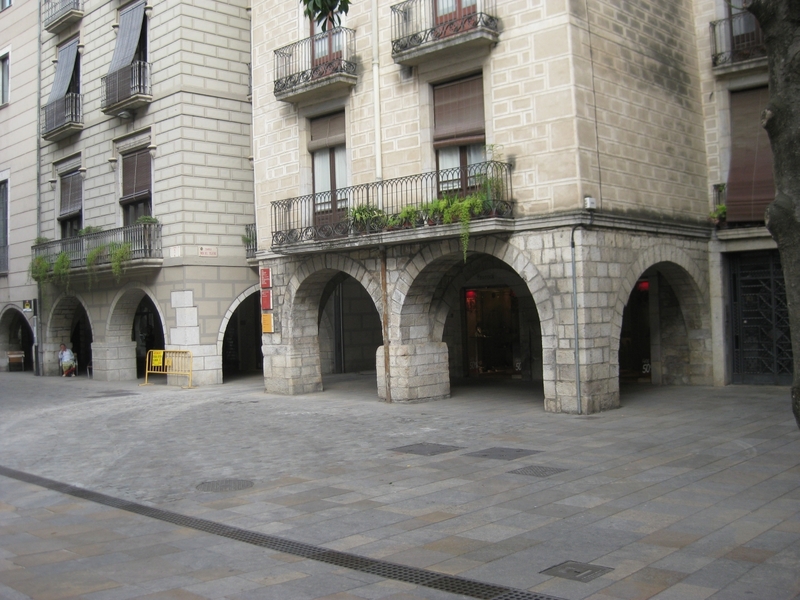 It’s one of those medieval towns that urban planners like to rhapsodize about: the organic growth; the variety of spaces and spatio-temporal experiences as you walk through it; the multiple uses assigned to spaces – street, square, parking lot, market all in one! 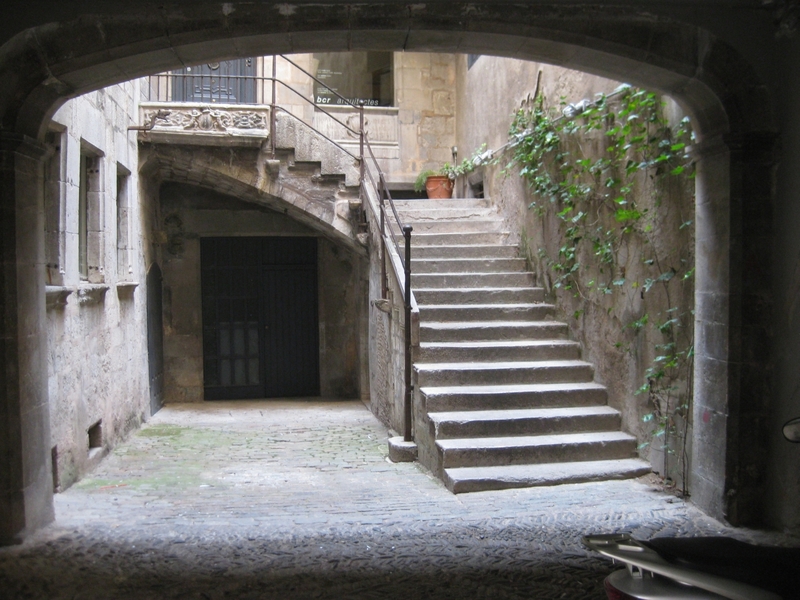 The old town sits on a rock at the confluence of rivers, and is filled with winding streets, surprising squares, a fine set of walls, and a stupendous set of steps to the cathedral. The cathedral itself is monumental, and a bit surprising. 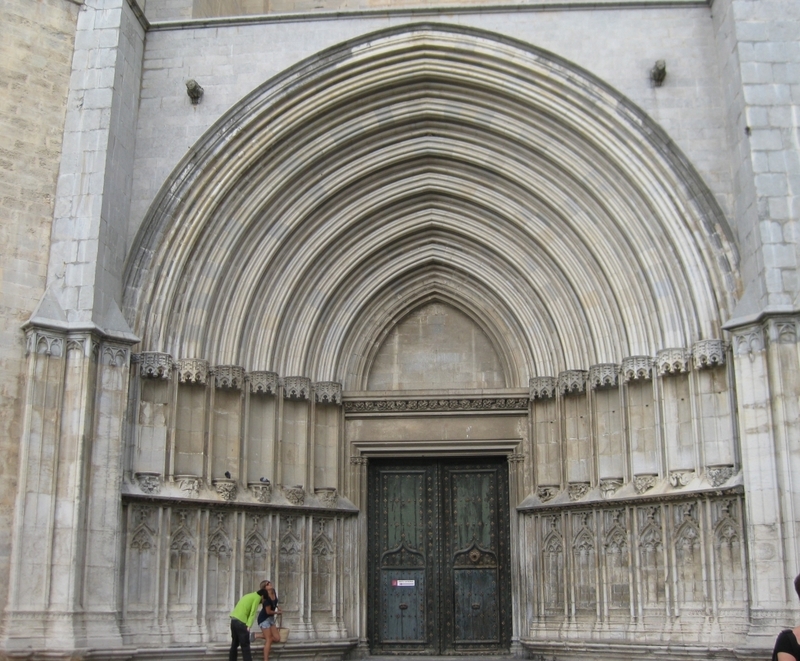 I plan another post on the characteristics of Catalan Gothic, but suffice it to say that although the arch on this side portal is pointed, this is not your Frenchman’s gothic. The church is enlivened, or ruined? 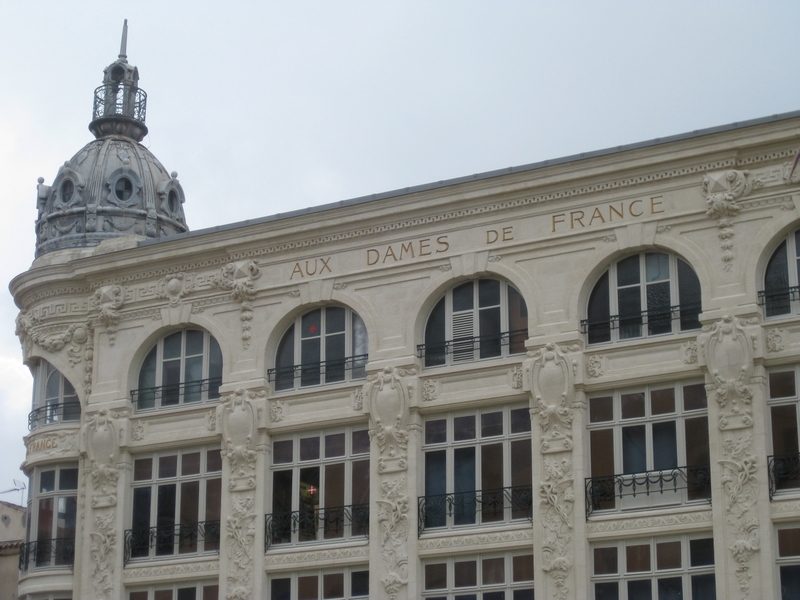 by an enormous late baroque façade applied over the original sober elevation. At that time, the steep and positively enormous flights of steps to the main entrance were added. I imagine that before that, a winding ramp led the faithful to the door. 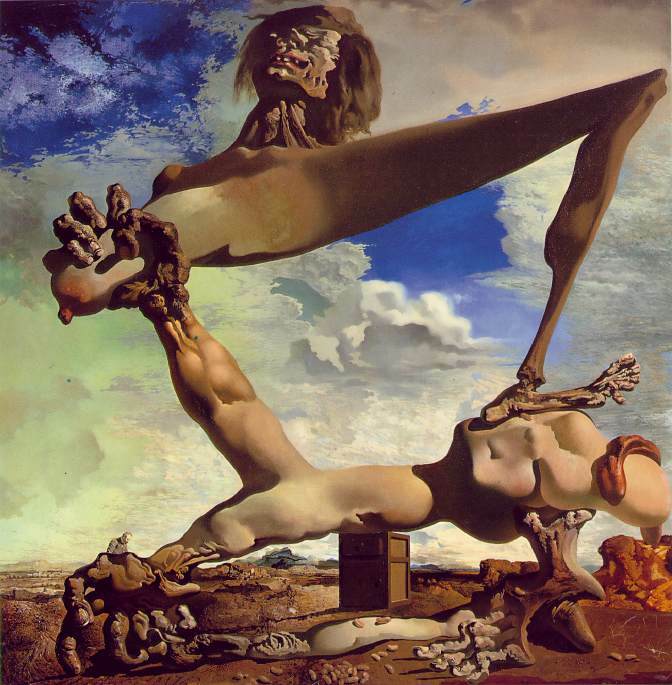 When I was in high school, I loved Salvador Dalí. I knew all his paintings, read his biography, his novel, and his autobiography (The Secret Life of Salvador Dalí.) I vividly recall the first time I saw one of his pictures: it was in fourth grade, and I opened a book that had his premonition of the civil war. I thought it was the weirdest, most grotesque thing I had ever seen. He did a lot of junk, but at his best, he was very good. 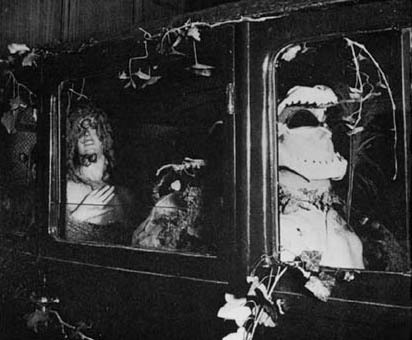 I always wished I could have attended the Exposition Internationale du Surréalisme and seen Rainy Taxi, with the bedraggled mannequin in the back seat, water cascading through the roof, and snails crawling over her limbs. 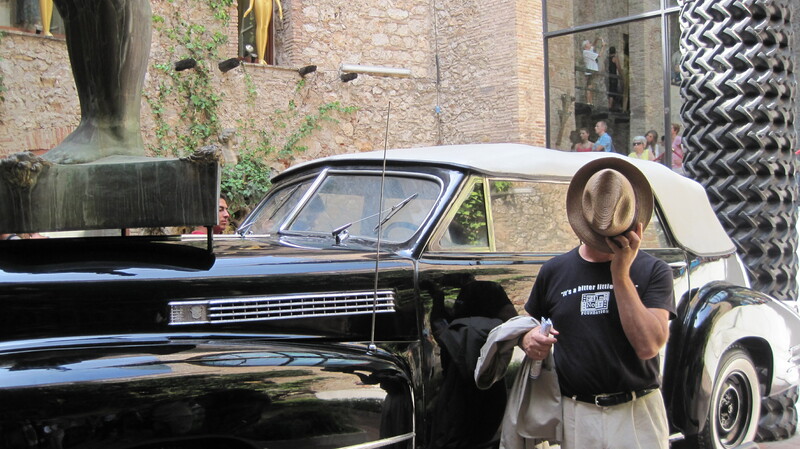 Seeing the car in the lobby of the Figueras Theatro Salvador Dalí was a thrill. I still get a kick out of much of his work. There’s no surrealist like him. The ancient church across the street from the theater is a beautiful complement to his craziness, and one he surely appreciated.